Front Row: L-R: Mrs Davidson, JP Kamara, M.A.C Renner, Mr. Deveneaux, AL Robinson, Mr Brima Conteh, Ms Kargbo, Prince Thorpe, Ms Thorpe, Ms Kabba. 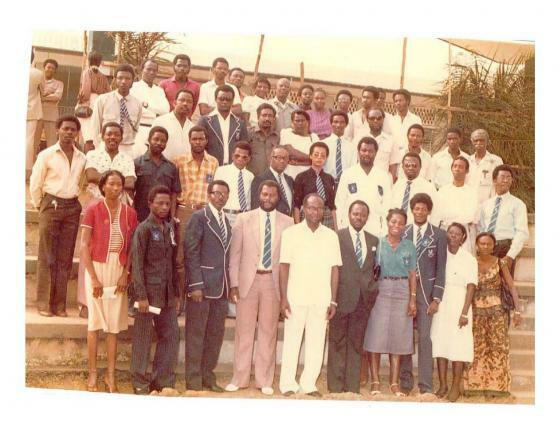 Second Row: L-R: Mr Faulkner, Wilmot Johnson-Cole, Walter Davies, Unkown, SBB Dumbuya, unknown, Ms Lamb, SBC Labor, unknown, Knightingale, Okrafor. Third Row: L-R: Mr. Bockarie, Mr Duganson, Harold Thorpe, unknown, Ajara Tejan Conteh, Madani Kamara, Mr Adjivon, Mr. Collier, unknown, Mr Russel. Back: Richie Jones, unknown, Fr. Fillie, Mr Williams, Mr Wright, Yvonne Harding, Mr. Valentine, Miranda Davies, Belinda Leigh, Ms Annie-May Cole, Mr. S.N Dumbuya, Mr Nicol, Mr Simeon Johnson.